This was the first Australian book to seriously confront what 1 in 5 people know from personal experience – that bullying is rife in workplaces around the world. The second, updated edition, with additional information, is now available! We spend more time at work, interacting with colleagues, than we spend at home with our families or socialising with friends. It is important then that our workplaces should be safe. Yet harassment, bullying and violence are facts of working life and their impact at all levels can no longer be ignored. 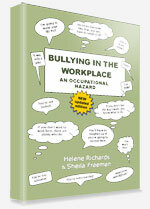 This new edition of Bullying in the Workplace: An Occupational Hazard takes a comprehensive and in-depth look at the nature of the bullying. Packed with real-life case studies, Bullying in the Workplace enables the reader to understand the negative impact it has on individuals and organisations and offers practical advice on how to identify and eliminate bullying from the workplace, now and in the future. … continued and deliberate unfair, unjust or abusive treatment of an individual at work by one or more co-workers, supervisors, managers or customers. Bullying in the Workplace: an Occupational Hazard shows you how you can fix these problems whether you are a manager or a worker affected by bullying.